The 20th annual DENSO Spark Plug NHRA Four-Wide Nationals was a race to remember for Lucas Oil backed Hector Arana Jr., who picked up the win on his EBR amongst a quadrant of champions consisting of reigning champ Matt Smith, five-time champion Andrew Hines and four-time champion Eddie Krawiec. The win comes after NHRA penalized all v-twins by adding 15 pounds to the minimum weight in an attempt to maintain parity in the class. 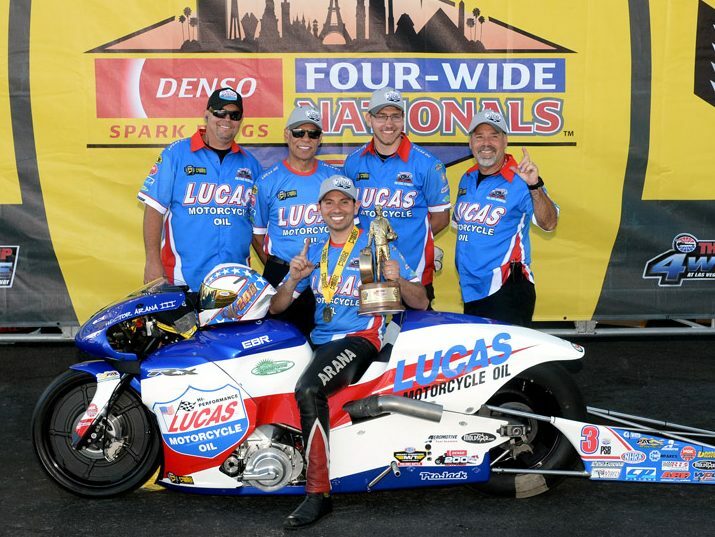 Fellow Lucas backed and v-twin rider M. Smith came in second as Hines broke on the starting line and Krawiec fouled out with his red light start. Arana Jr. cruised to a 6.907 at 195.97 to pick up his second win at the Strip at Las Vegas Motor Speedway facility. The NHRA circuit will travel to Houston to the Mopar Express Lane NHRA SpringNationals Presented By Pennzoil April 12-14 for the fifth race of the 2019 season. The Pro Stock Motorcycles will be off but the Nitro Harleys will be in action. FINAL — Arana Jr, 6.907, 195.79 def. M. Smith, 6.903, 197.02, Krawiec, foul and Hines, broke. 1. Andrew Hines, 201; 2. Hector Arana Jr, 198; 3. Eddie Krawiec, 188; 4. Matt Smith, 170; 5. Hector Arana, 85; Jim Underdahl, 85. There are videos on the Cycledrag Youtube channel (please subscribe here) and the Cycledrag.com Facebook page (Please like here) and more will be coming soon. Check back daily. Tags Hector Arana hector arana jr.
NHDRO Brings Drag Bikes Back to Gainesville!